Sorry Mr. Turkey, but I still have a lot of Christmas projects left on my create list, so please bear with me while I share another holiday project, I'll have a Thanksgiving project to share tomorrow! Like many of you, I've dabbled in a little bit of everything when it comes to crafting! Many years ago, I made patchwork Christmas Tree Skirts and Pillows for gifts, I told DH when I was working on this weeks project, I sure which I had an eCraft back then! It sure would have saved me a lot of time! This week, myself and the other members of the eCraft Design Team were challenged to create a 3D Christmas project using stamps from Pink by Design and the eCraft. 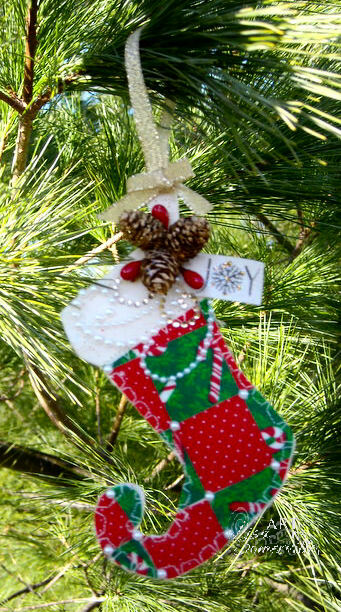 So I dug out that now "vintage" material I saved for a rainy day, and created a Patchwork Stocking Ornament. The stocking pattern is from eCraft, I did alter the pattern a bit, by removing some of the "nodes" (see downloading directions for the how-to). This enabled the cutting to go a bit faster. I applied Heat and Bond to all my fabric pieces before cutting, this made working on the patchwork a bit easier. To embellish, I added some Zva Creative Pearls, Pine Cones from Hobby Lobby, and the stamped tag using one of the Christmas Sentiments from Pink by Design. Click here for downloadable directions and a supply list. For added inspiration using this weeks Challenge Theme, be sure to stop by the eCraft Blog to see what the other designers created this week. Just love the design on this. Can't believe you held onto that material all this time, it's beautiful! ADORABLE! Love the elf like design of the stocking! love the elf looking stocking and the patchwork on it! Hi Lisa ~ Love the download...thanks for sharing...sry I have not been around lately...I have had serious mojo issues and health as well...thanks for sharing and Happy Thanksgiving to you and yours! This is in regard to the Happy Thanksgiving card designed for Our Daily Bread. Though there were many lovely cards, I kept being drawn back to yours because the colors and design evoked a peacefulness and quiet joy, simple yet profound. So, thank you for the inspiration and Happy Thanksgiving to you and yours, as well. Your Thanksgiving card is beautiful - I love it! Different but do love the colors you have use. Cute stocking! Love the colors and the style! And really love the pine cones and the pearls! Beautiful addition! LOVE this! So fun and adorable! What a perfect stocking!